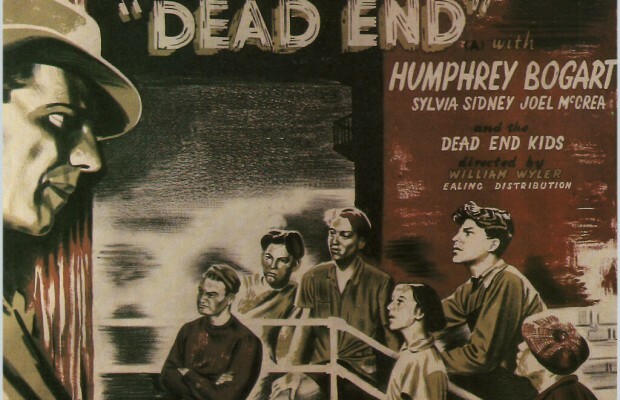 Toronto Film Society presented Dead End (1945) on Monday, July 13, 2015 in a double bill with The Naked City as part of the Season 68 Monday Summer Series, Programme 2. 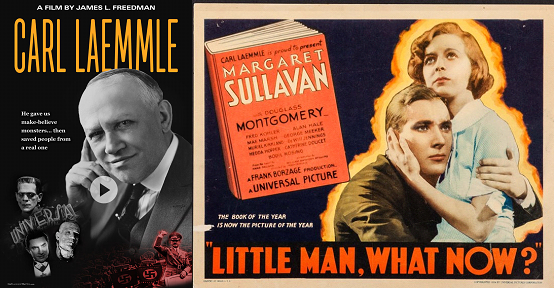 Production: Samuel Goldwyn. Director: William Wyler. Script: Lillian Hellman, from a play by Sidney Kingsley. Cinematography: Gregg Toland. Music: Alfred Newman. Editor: Daniel Mandell. Cast: Sylvia Sidney (Drina Gordon), Joel McCrea (Dave Connell), Humphrey Bogart (“Baby Face” Martin), Wendy Barrie (Kay Burton), Claire Trevor (Francie), Allen Jenkins (Hunk), Marjorie Main (Mrs. Martin). And: The Dead End Kids. The film (and the play it is based on) is set in an area of New York where rich and opulent people live virtually side by side with a crowded slum area. The Dead End Kids are a gang of street children led by Tommy Gordon (Billy Halop) involved in petty crime. A new kid, Milty, joins the gang and is mistreated at first, but finally accepted by them. Mobster Baby Face Martin (Bogart) who grew up in the area, returns for a visit to his mother and his ex-girlfriend (Trevor), who is now a prostitute and fatally ill, but is rejected by both of them, and decides to compensate by kidnapping for ransom a rich boy who lives nearby and whose father has been attacked by Tommy and the gang and has been injured by Tommy; but Dave Connell (McCrea), an unemployed architect, intervenes and kills Martin after a struggle. When the police arrive, Spit, a member of the gang, denounces Tommy, who retaliates by wounding him, but Dave persuades him to surrender to the police and offers to take care of him afterwards. The stage directions for the (very popular) play specified a setting in an area of New York near 50th Street in Manhattan. The film painstakingly recreates this location in its sets, making it more clearly 53rd Street. Grafitti seen chalked on walls in the film reads “East 53rd Place Gang Members only”. The film was nominated for Academy Awards for Best Picture, Best Art Direction, Best Cinematography, and Best Supporting Actress (Claire Trevor). 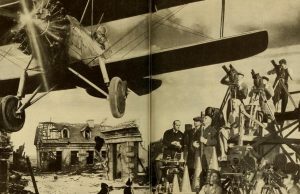 Is considered one of the finest of American directors for his work in both silent and sound films (his 1929 part silent/part sound The Shakedown will be shown during the TFS “Raiding the Vaults” weekend in August at the Gorge Eastman House in Rochester). After he refused to follow in his Jewish father’s footsteps in the haberdashery business, his mother obtained work for him from her cousin Carl Laemmle at Universal Studios, where he had a prolific career in silents, specialising in Westerns, then achieved major recognition for his work for Samuel Goldwyn in the 1930s and 1940s, which included such classics as Dodsworth (1936), Wuthering Heights (1939), Jezebel (1938), The Westerner (1940), The Letter (1940), The Little Foxes (1940), Mrs .Miniver ( 942),and The Best Years of Our Lives (1946). 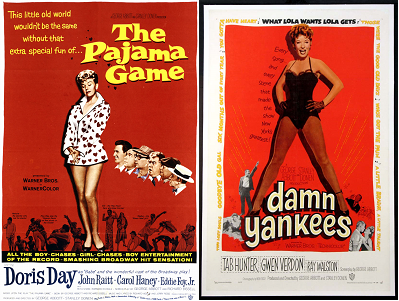 Later successes included Detective Story (1952), Roman Holiday (1953) and Ben-Hur (1960). He was admired by actors, even when his perfectionism demanded multiple takes of scenes for which he would give no better explanation than “Do it again. It stinks” (to Henry Fonda in Jezebel after 40 takes of a particular scene), or “Be better” (when Charlton Heston quizzed him on Ben-Hur). Laurence Olivier, however, credited him with teaching him how to act for the screen. Wyler refused to film the scripted ending of Wuthering Heights, finding it false to the spirit of the book, forcing Goldwyn to have it shot by someone else. His filming style is characterised by use of deep focus (pre-Citizen Kane), diagonal compositions and long, often complicated, takes. A successful playwright and screenwriter in the 1930s and 1940s, she was accused of Communist sympathies by the House Committee on Un-American activities in the late 1940s and blacklisted, though she continued to find work on Broadway in the 1950s. Her reputation went into decline in the 1970s and 1980s when she was attacked by other writers for lying about her political sympathies in her memoirs and for also lying about her association with Ernest Hemingway and the Spanish Civil War, and for inventing in her memoirs much of what she claimed was factual in the story that became the popular film Julia in 1977. Her strongest personal relationship was with fellow writer Dashiell Hammett, though the two never married. Ranked by the American Film Institute in 1999 as the greatest male star in the history of American cinema, he was born into a wealthy and fashionable family and enjoyed a privileged childhood in which he attended several private schools where he was a reluctant and indifferent student and ultimately expelled from the last of them (or withdrawn by his father, who was disappointed at his poor record (accounts vary). He enlisted in the US navy in 1918 and enjoyed a successful career there; after being demobilised he took various jobs before working for a film company started by a childhood friend. 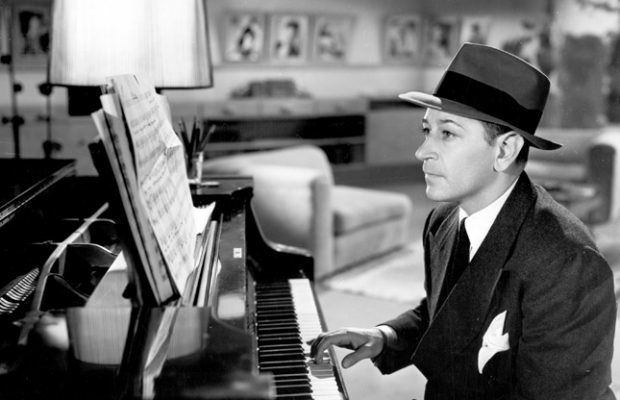 He then began a stage career in minor roles in Broadway productions, usually drawing room comedies, between 1922 and 1935, while also appearing in small film roles and signing with Fox in 1930, where he became a close friend of Spencer Tracy and appeared with him in John Ford’s Up the River in 1930. In 1934 he had the role as an escaped murderer in the play The Petrified Forest–a part very different from his previous socialite roles, that was so acclaimed that, when Warner Bros. bought the film rights, Leslie Howard, who starred in both stage and film versions, insisted, against Jack Warner’s objections, on casting Bogart in the Duke Mantee role he had played on stage. Despite his resounding success, Warner’s then typecast him in a series of mediocre B-movie crime films that gave him little opportunity to develop his professional skills and subordinated him to leading actors such as James Cagney and Edward G. Robinson. His only significant roles in this period came in Dead End, Black Legion (both 1937), Angels with Dirty Faces (1938), and, in a minor role, They Drive By Night (1940). Born Sophie Kosov of Jewish immigrants from Russia, she made her first theatrical debut at the age of 16 and quickly became a leading actress on Broadway before being signed by Paramount in 1931, where she was typecast as a typical Depression-era heroine– a downtrodden, poor but proud girl of the lower classes who often played the role of the girl friend or sister of a gangster or criminal in: An American Tragedy ((Von Sternberg, 1931), City Streets (Mamoulian, 1931), Sabotage (Hitchcock, 1936), Fury, 1936 and You Only Live Once, 1937–both Fritz Lang), and Trail of the Lonesome Pine (Henry Hathaway, 1936), as well as Dead End. Her career began to decline in the 1940s, when she got a reputation for being difficult to work with while claiming that she objected to being typecast, with the result that the remainder of her career was spent mostly on the stage or on television. Born named Claire Wilmington, she had an early interest in acting and by 1932 was starring on Broadway. Her film career began in 1933, mostly in roles as a hard-boiled but warm-hearted floozy, though she was also recognised as a skilled screen actress for her roles in such films as Stagecoach (1939), Dark Command (1940), Murder, My Sweet (1944), Born to Kill (1947), Key Largo (1948), Raw Deal (1948) and The High and the Mighty (1954). Her later career was mostly in television. Recognised as one of the finest Hollywood cinematographers, in particular for his work on Citizen Kane in its use of deep focus camerawork, innovative lighting and camera placement, which influenced a whole generation of later cameramen. 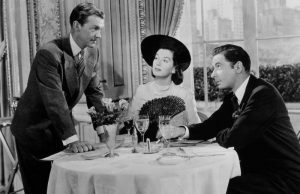 Some critics argue, however, that some of his techniques were anticipated by others, especially William H. Daniels for his work with Greta Garbo, and Norbert Brodine for Wyler’s The Good Fairy in 1935.